In Hyderabad, there is a legendary restaurant called Paradise and they serve what is arguably one of the best Biriyanis in this galactic sector. Now what does that have to do with the Indian Premier League T20 tournament? Actually, nothing. Also, in San Antonio, Texas, there is a Chinese restaurant named Golden Wok where you can choose vegetables of your choice from a bar and the chef will, in one quick burst of flame, burn your pickings into a homogeneous, gelatinous goo and with a beaming grin say “Have a nie day“, and serve it to you with a bowl of rice that does not quite smell of Madurai Malli. What does this have to do with T20 cricket? Actually, nothing either. But you see, the delicate taste of a Biriyani comes from slow cooking and a careful selection of spices, unlike Wok-fried Vegetable Goo from San Antonio, which tastes exactly like Wok-Fried Vegetable Goo from Denver, because as the saying goes, “Contempt (for patient cooking) breeds Familiarity (of taste)”. It is very hard to achieve subtlety of taste in Americanized Chinese fast food. And what does that have to do with T20? You see, I find it hard to write authoritative, hard-hitting, thought-provoking essays on the fine game of Cricket (like this) because of the minor matter of qualifications. The only reason I made it to cricket teams in the past was to make up numbers (Dei, we are 10 and we need a fieldsman at deep fine leg), and I am a slow-medium pace batsman and a right-handed bowler who could, for most part, manage to deliver the red cherry 22 yards without it needing to bounce twice. So instead, I will write about the BUSINESS of cricket. Many years ago, it used to be the business of CRICKET, and Kerry Packer made it the BUSINESS of CRICKET, but with the IPL, cricket has simply lost its uppercase. Not that I don’t enjoy T20. I do like Wok-fried vegetable goo once in a while. 2. After a while, the big boys take over and pull no stops to squeeze money out of everywhere, such as from unearthly ticket prices, pay-per-view TV channels, advertising and merchandizing. Robber Baronia. Ads start once the 6th ball of an over (even if it is a no-ball) has been delivered. There are animated, hyponosis-inducing ads on the boundary signboards. But then hey, what gives me solace is the fact that I can still take refuge in the ad-less world of cricket commentary. I can still relax in the familiar cliches of Ravi Shastri, the soul-deadening boredom of Arun Lal or the sweet Carribean twang of Ian Bishop. Right? Right? Ranjit Fernando cannot say “Six” any more. It is “DLF Super Six“. Holy Arranged Matrimony! it’s now brand names embedded into commentary. So what else is possible now? India are AUE Motoring along now. That was a Sri Krishna sweetly timed shot. Ganguly’s batting has been Citi sub-prime. Wink wink. Rahul’s technique is completely bug free. Must be all the Pepsi. Wink wink. Update: If you also are suppressing an irresistable desire to strangle a certain pug with a sock, please sign this now. Previous Previous post: What’s in a spelling? just cant stop laughing… holy hilarious matrimony..
You can only take the donkey to the river. You cannot make it drink. Same with IPL. Its here because organizers know people would drink. Somebody just had to take them to the water. Thala, pinniteenga! Raja Sen wrote an article for a similar purpose. And asked people to sign petition for scrapping those ads. Maybe you could attach this article along with it. Ashok: Rolling on the Laughing Floor? Sharad Pawar and Lalit Modi are a devastated pair. Not just because of your post, though they are in the process of putting out the contract on everyone who dares disparage, but because they have just found out that there is a lot of betting happening out there and the BCCI AIN’T GETTIN NUTHIN’. They are waiting for someone, say the ICL guys, to do something about this so they can steal the idea. SOMEONE BETTER DO SOMETHIN REAL SOON! I wish there was an adblocker for TV, like the one for Firefox. It should also auto-mute the soundtrack for ads. Though in this case we’ll probably get a blank screen for most of the time. Awesome post…I was just thinking of writing a post about all these cliches by the commentators…..
Just Too Good…A dig at T20,the krish ashok way i guess.and hey..Dont show that snapshot with all the ads of reebok ,TN government Etc to lalit modi.I am sure he will say he was thinking of that concept for the past 150 years and would implement it righaway as though it were his own. BTW::Inspite of all this nonsense surrounding the T20,I think it is the future. i guess, the next business plan of ‘bcci’ would be to make itself a public traded company! if it does, ‘bcci’ would be one stock whose price will keep going up irrespective of the direction in which the sensex moves. btw, did you check out your blog stats? your miss (india) timed reference to ganguly has cost you a complete bong blackout. Ever hrd Cricket commentary on radio. in Hindi of course. As if the ” dheemi gaind, gathi parivartan, atirikikt daud, androoni kinara ” and “behterin shot cover aur extra-cover fielders ko cheeeerta hua” were not enough, they introduced , “Aur Sehwag ke balle se yeh laga Dabur Lal Dant manjan Chauka” and “Bharat ko pehli safalta, Hayden ka Cibaka fresh Wicket mila Zaheer ko”. We used to have a great time mocking these and imagining how TV commentary , English i.e. would sound in its ADsavatar. And here it arrives. “Not that I don’t enjoy T20. I do like Wok-fried vegetable goo once in a while.”…. You’ll never stop taking a dig at saravana, will you.. paapa chaps.. I wonder , how do you get time for all this…specially the graphical illustrations inspite of the Web 2.0 tribe you are leading. Wow, that’s a great article! Hilarious… but bitingly bitter. And rightly so. innum idhayam nallennai, anil semia ellam enga ? Good going. You should beat those north indians like Amit Varma and Greatbong in this years Desipundit awards and achieve Periyar’s dream. In fact the pepsification of the commentary has already started, with the experts displaying the cans and talking about their thirst. I wonder if Kama Sutra condoms will get into the act. Think of Greg Chappell twiddling with one in his thumb while commenting! A truly protected moment for cricket that will be! Ha ha loved your UPDATE. But I do not want to strangle the poor pug — his mug already looks strangled. My grouse is the manner in which these so called “greats of cricket” leech at the cheerleaders and pass lewd comments.Especially a certain “gentleman” from the neighboring country. have a nie day…robber baronia….abdominalia!??? do u like have a team that works for you??? been reading your blog for a longish time now…. great post…. Well, you havent mentioned the various other aspects of IPL.. And if football can do it.. 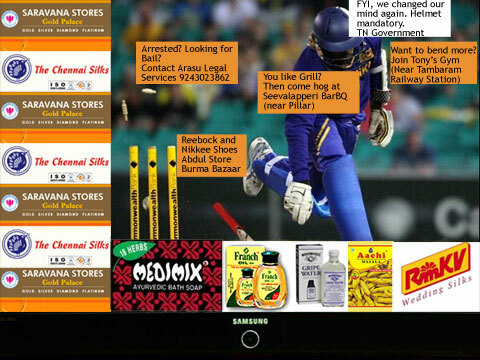 So can cricket… Its all the part of the game..
Killer illustration wit strategically placed ads!! u rock! Nice read. But i love the Chinese stuff and cola. Our advertisements in the IPL have been rejected because some- some peoples are objecting to cheerleader lahdies dancing in skirts and some shirts-like cloths. Very much obliged if you can use your esteemed blog services for highlighting the neglect of our company products. (Ad rates include a year’s supply of underwear to the players, for proof ask Sreesanth who is irritable when he does not wear our materials). does that explain why he is cryings last midnight? Loved your seasonings too :). Awesome Blog, Great Read, Terrific Wit .. Much Appreciated ..
great post! Arasu legal services and Seevalapperi BarBq join a long list of luminaries including Loo Su Mani and Matter Mani. Really,those ads filling up the screens are such a nuisance,I feel like kicking them. Also the intrusion of ‘adwords’ into the commentary has made it look so artificial.This is a great post.You have written it in a very humorous manner. err, who sends those pingbacks^^^?? I would like to know! Enjoyed those visuals, KA, since soon we will not be able to see any of the cricket and only the ads! Abdominalia indeed. Unfortunately, I continue to watch it, despite the cribs and whines (as I’m sure many of you do too), and the IPL and BCCI are laughing all the way to their banks. “Citi moment of success”.. aaargh!! excellent, i have been going through all your posts..
menu 2.0, HMK n the ad cricket, too good.. I came accross this article when i was trying to google WTF a ‘citi moment of sucess’ means !!! Now the commmentry is much similiar to the ones we used to [may be we still] get in the AM Radio channels ..
Aur yeah laga shandar Dabur chawanprash chauka ……. How couldst thou forget to add ‘P James Magic Show 9841579310’ to the list of ads ?? A place to lay my weary head. rags upon my feet, clothes upon my back. And love as if to eat. Hello there, You’ve performed an incredible job. I’ll certainly digg it and personally recommend to my friends. I am confident they’ll be benefited from this site. wish for enjoyment, as this this website conations genuinely good funny information too.